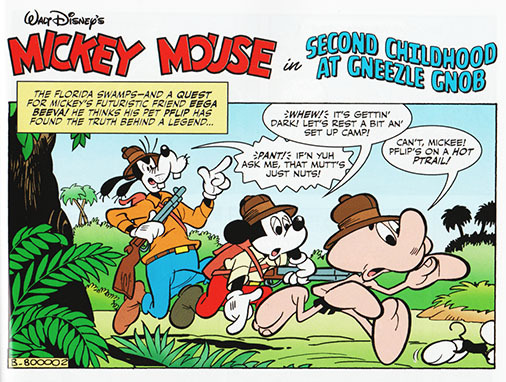 Disney Comics Randomness: Return of the Gneezles in "Second Childhood at Gneezle Gnob"
Return of the Gneezles in "Second Childhood at Gneezle Gnob"
Do you remember the Gneezles from "Mystery of the Swamp" by Carl Barks? 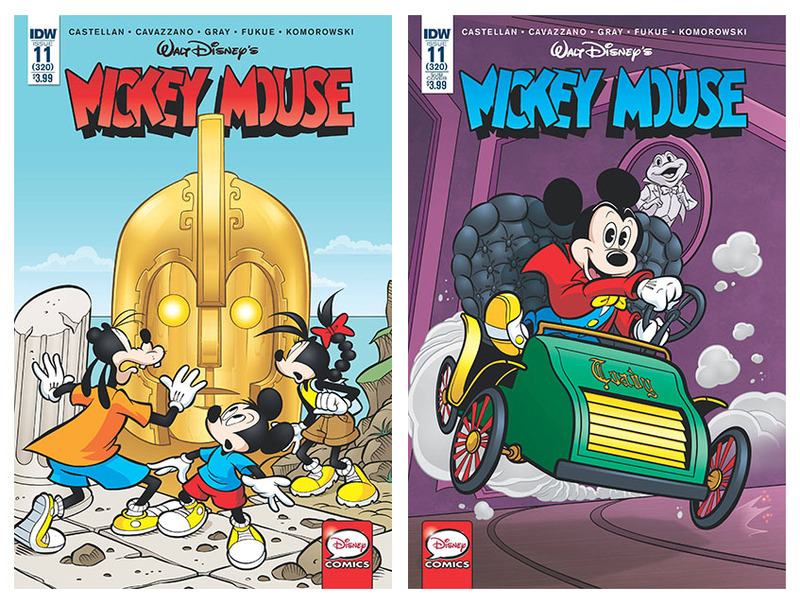 If not, you should go read or re-read this old classic, because now they are back – in a Mickey story! "Second Childhood at Gneezle Gnob" is written by Ivan Saidenberg and drawn by Roberto O. Fukue, both creators that worked for Brazilian Editora Abril. 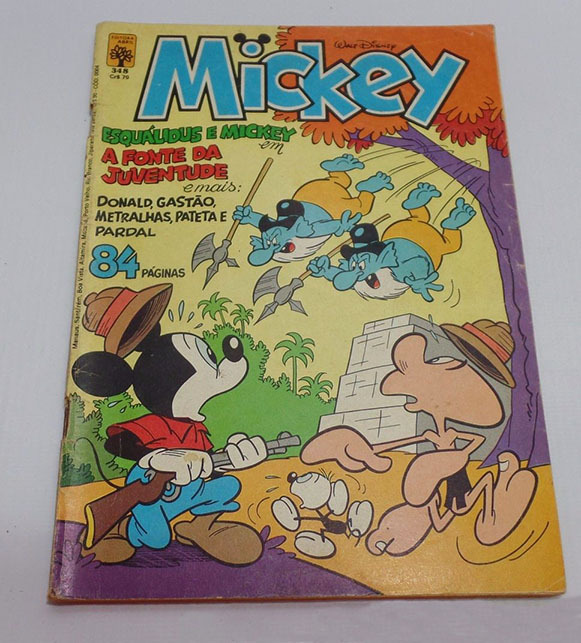 Originally published in 1981, the story is now finally published in a language I can read, and can be found in this month’s Mickey Mouse #11 (320) from IDW. According to Ivan Saidenberg’s daughter, the writer was a big fan of Eega Beeva and even got a nickname after the character while at school. 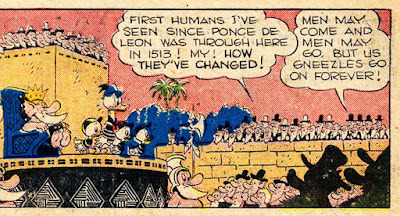 But he probably liked Carl Barks’ stories a lot too, because "Second Childhood at Gneezle Gnob" is a real tribute story with a lot of ideas taken from "Mystery of the Swamp". Not only do we get to meet the gnome looking Gneezles again, we also have some of the same gags and scenery as in the original. It’s still a different story though and not a remake of Barks’ story. The Gneezles still use an alligator skin for hiding. The same traps works just as well as when the ducks were roaming around the swamps. We see Gnasty Face on top of the temple in Gneezle Gnob. And the swellers are still looking for a fight. In the original story it sounds like the Gneezles have been living for hundreds of years. If you wonder how, we might actually get the answer to that in "Second Childhood at Gneezle Gnob"! From "Mystery of the Swamp"
I'm not going to spoil the story by going into more details, but I have to say I enjoyed this story a lot! 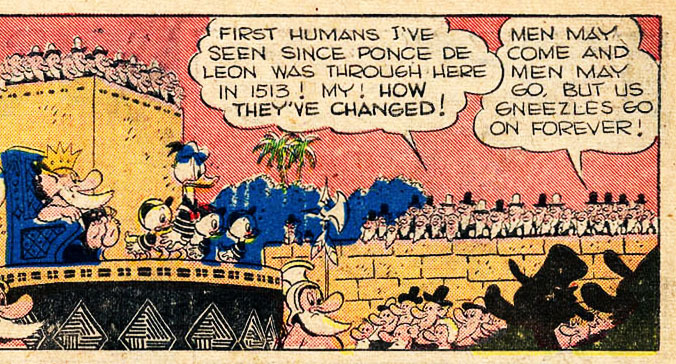 Yes, there are a lot of similarities and re-used ideas from Carl Barks’ story, but that doesn’t matter. I look at this as a tribute story, and it was fun reading about those pesky swamp dwellers again. As I've said before, I think it’s great that IDW find some of the more uncommon but still interesting stories to publish. Together with the Eurasia story, Mickey Mouse #11 have something for both new and longtime Disney comics fans. I enjoyed this story, too. And I agree that the reuse of the various elements from Barks's story is a feature, not a bug. As you say, the story is not a retread plot-wise. It just uses those elements because they are what make up the Gneezles' world for us. And why wouldn't they keep using the same trap, when it works so well? "Men may come, and men may go, but us Gneezles go on forever!" A reference to 100 years old pop culture :) I can’t say I have this one on my playlist. Also, it sounds like the Gneezles already had listened to the records they stole. Thanks for the visit and the review!